Maidenhead, U.K. – Dec. 18, 2017 – Flexera, the company that’s reimagining how software is bought, sold, managed and secured, today announced that its world-renowned Flexera Software Vulnerability Database is now integrated into FlexNet Code Insight – the market-leading open source license and vulnerability detection platform. The integration gives software developers unparalleled insight into vulnerabilities that may lurk within their open source code, and the ability to remediate those vulnerabilities before shipping their products to customers. 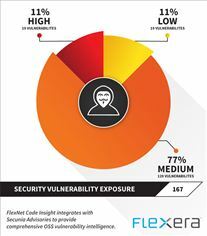 With today’s announcement, FlexNet Code Insight is narrowing the risk window – providing comprehensive intelligence on discovered vulnerabilities. Organisations can now protect their products – and their customers – faster by identifying vulnerabilities as soon as they’re made public. Armed with better information, sooner, they’re then in a much better position to assess, prioritise and patch vulnerabilities before they’re exploited. Additionally, FlexNet Code Insight is able to alert development and security teams when new vulnerabilities are discovered in already shipping software. Secunia Research at Flexera is a research team with globally recognised expertise in discovering, verifying, testing, validating and documenting vulnerabilities on tens of thousands of applications and systems. Our experts work under strict ethical guidelines and collaborate with the research community and software producers to guarantee the quality of the vulnerability information we document.